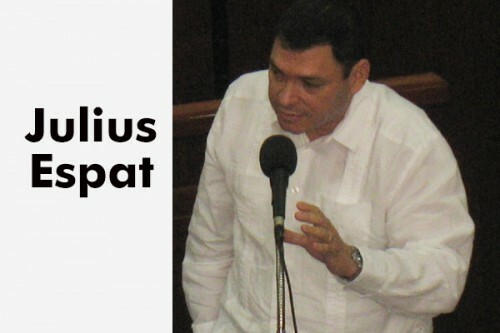 A motion presented to the House of Representatives Wednesday by Julius Espat, the People’s United Party’s Cayo South representative, to reform the Public Accounts Committee (PAC), through an amendment to the rules which would see the private sector, unions, churches and civil society getting majority seats on the committee, “fell on the floor”, after a debate which, at times, deteriorated into a shouting match. Espat (Member of the People’s United Party — PUP) chairs the Public Accounts Committee. Its other members are Erwin Contreras (Member of the United Democratic Party – UDP), John Saldivar (UDP), Patrick Faber (UDP), Hon. Michael Finnegan (UDP), and Rodwell Ferguson (PUP). Espat’s motion proposes that the standing orders of Parliament be amended so that only non-ministers can represent the UDP on the new body, which would have only two UDPs instead of 4; 2 PUPs; and three new seats for the group of social partners, who are represented in the Senate – the upper house of Parliament. The new entity Espat proposes is a joint select committee; however, right after he proposed the change, Prime Minister Dean Barrow rose to register his objection. “Mr. Speaker, I am very sorry! This motion is entirely and wholly misconceived, shot through with procedural and substantive errors from beginning to end and I – after I’m finished speaking – will ask you for a ruling, Mister Speaker, because it is my submission that it is out of order and has to fall, without the merits of the motion being debated,” he told House Speaker Michael Peyrefitte. “This motion enjoys the support of the Belizean people; if you believe that it is fundamentally flawed, then bring your objections to the House and let us fix it,” Opposition Leader Francis Fonseca urged. The speaker said that the process laid out in the standing orders, for such motions, must be followed; and in his view, they weren’t in this instance. “What we are asking, Prime Minister, for this House to consider—consider—the concept which is farfetched from him, because he is only thinking of power, we are thinking of governance… and I understand this concept is far beyond his imagination, because he doesn’t think that way – think of your people, Prime Minister… we need to put systems in place that can correct you and that can correct us! The Belizean people are tired of the rhetoric; they want systems in place that can work for us. If you are serious, you would join us and make sure everything happens your way, Daddy Barrow. Make sure it happens for your children,” Espat pleaded. “How can you come here and try to hoodwink the Belizean people and suggest that you want to do this to make things more transparent, when, in fact, you are trying to upend the first principle of our democracy?” argued Barrow. He also objected on the basis that Espat had not presented the proposed amendments to give effect to the reformed committee, as the rules require. “His whole purpose of bringing forward this motion is to take away attention from the fact that as chairman of the Public Accounts Committee he has not been doing his job. That Committee, of which he is the chair, can be called into session; it can look at the Auditor General’s reports – which of course are now laid before the House, unlike one time when the PUP was in office… so there is no need for this absolutely untenable, convoluted, ill-conceived motion, which, as I said, Mister Speaker, can go nowhere – except, they like to talk about grandstanding, except the member is trying to grandstand. It can get him nowhere,” Barrow said. He also said that he regrets that the Belize Chamber of Commerce and Industry, which has issued a statement supporting Espat’s proposed motion, has allowed itself to be dragged along when they really should have researched the feasibility of the motion. “He thinks that this country is a law firm run by Daddy Barrow but it’s not… this can be done if you want it to be done!” Espat contended. Fonseca said that Barrow’s long and technical objection is based on valid concerns; but that notwithstanding, said Fonseca, the objective is to put on the table the need for reform and the PUP is prepared to work with the government. “The question is, can we agree for us to reform this Public Accounts Committee? My sense is that there is a general perception among the Belizean people that there is the need for such reform, and the question is: how do we move forward?” said Fonseca. He called on the Prime Minister to assist in the process of enhancing the motion so that it can work. Fonseca also said that there has been a recurrent problem with the PAC. He said that the UDPs don’t want to go to meetings and they don’t want to work with the chairman, Espat. “If the Public Accounts Committee was functioning, Mister Speaker, and the chairman could table these matters before the committee, and get some consensus of how they can improve the work of the committee; he would do that, but the committee is not functioning!” said Fonseca. Despite the pleas from Espat and his supporters on the Opposition side of the floor, his motion was not entertained. “Based on the objections and my reading of the Standing Orders, your motion falls on the floor and it has to be dismissed,” the speaker ruled.